Carpal tunnel case file gives insights into this troubling condition. Carpal tunnel case file yields pain and tingling in the thumb index and middle fingers and NEVER the pinkie. Pain and tingling in the thumb, index and middle fingers is the order of the day; and sometimes part of the fourth digit. If the symptom pattern is different, for example in the first two only, then it's not carpal tunnel syndrome. Inexperienced clinicians, are inclined to think that every case of tingling in the fingers must be an impingement in the wrist. This next graphic is not what we may think. 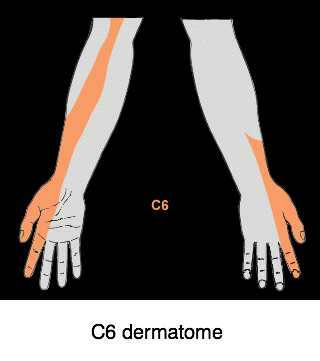 Paresthesias in the thumb and forefinger comes from an irritated C6 nerve root in the neck. 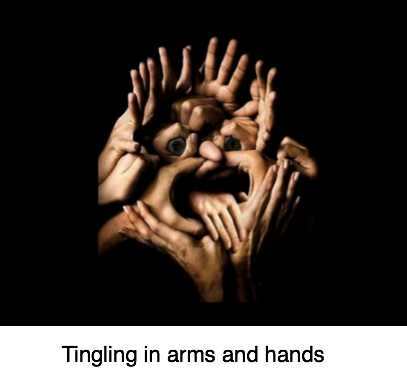 Turning the head and looking up will often provoke the symptoms in the hand, and the upper limb tension test would be positive but negative in a classic carpal tunnel syndrome. What complicates things is that it's often a so called double crush syndrome. 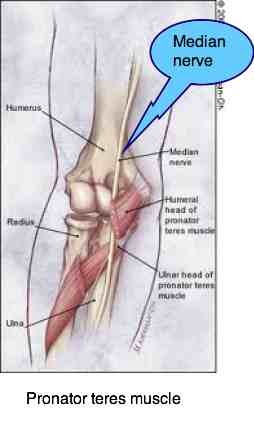 The median nerve is irritated in two or even three places. That means that both places of impingement must be addressed. A recent case displays the difficulties of this condition. A woman with a very degenerative lower cervical spine was given a crude and vigorous manipulation of the neck. Within an hour she had severe pain and, on the opposite side, tingling and numbness in the median nerve distribution; in the first four fingers. One would have expected it to follow a dermatomal pattern after a neck injury, and on the same side. But no, carpal tunnel case files don't follow the rules. She responded well, incidently; first we addressed the acute neck pain. That took about a month to settle down, and only then the tingling in the arm. I probably wouldn't have accepted her as a patient; she withheld vital information about the cause. But all's well that ends well. Notice how the Median nerve passes between the two bellies of the Pronator teres muscle, in the forearm, just below and in front of the elbow; it mimics the carpal tunnel syndrome. If you have tingling in the arms and hands then it's vital you take note, because your chiropractor will ask you, and to make the correct diagnosis, and thence the correct treatment, you must know which fingers tingle. A carpal tunnel case file should never be treated as gospel, incidentally. They make interesting and useful reading but they are anecdotes, without any scientific validation. You could make up a case file for a Flat Earth Society. Or a world created about 8,000 years ago, with the dinosaurs being just a figment in Darwinists' imaginations. The dinosaurs incidentally were wiped out when an enormous asteroid, six miles in diameter, crashed into the Yucatan peninsular some sixty million years ago. It turned the whole earth's axis. Coupled with a series of volcanic eruptions over India it meant a total change for the world's inhabitants; that would make for interesting reading of a dinosaur's case file too; I expect they also had a median nerve. A 62 year old butcher consulted me three weeks ago with pain and tingling in his right arm and hand. He uses his hands continuously, and the work is often repetitive and difficult. He has no neck pain. Fifteen years ago, tingling began in the left hand, for which he was operated. The procedure was successful, but he was quite disabled for some months, and the tingling never entirely stopped. Five months ago paresthesias began in his right hand and forearm. The pain began to wake him in the early hours. Eventually, not wanting to go through with another medical case file, he consulted me. Interestingly, he had pain in the forearm where the median nerve passes through a tunnel between the two heads of a pronator teres muscle, and a fixation of the first rib in his lower neck, but no signs of impingement in the wrist. This is what we call a classic double crush syndrome; each case file is different which is what makes chiropractic so interesting for the discerning mind. Despite the fact that there is no strong research confirming that chiropractic can help a carpal tunnel case file, I told him confidently that I could assist him. After three weeks of treatment, six in all, he says the pain and tingling in his hand is 70 percent less and no longer wakes him in the early hours. We are now into the rehabilitation phase to prevent a recurrence of his symptoms. Updates are important; you must be wondering, did he get properly better? He is now 80 to 85 percent improved according to the Boston carpal tunnel syndrome questionaire that we are using to evaluate progress. Now it's maintenance of the condition; he needs to do his exercises faithfully, and come for the occasional, but regular treatment. Perhaps every 6 to 10 weeks. I doubt it will get 100 percent better. Research shows incidentally that nothing will cure the condition; not surgery, not chiropractic and not pills; it will in most instances return and thus maintenance care is vital for each and every case file. Occasional but regular chiropractic care is not a popular subject in some circles, yet we have no difficulty with the concept in the management of say diabetes, for example. Carpal tunnel syndrome surgery is sometimes effective, but is not scientifically proven to cure this condition; nor is any other treatment including chiropractic. See all the swelling in the fingers. Chiropractors are not anti-surgery but we do think you should try the conservative treatment first. Mr S is very happy that he doesn't have to go through this again. "Cured"? Probably not. He will have to come in for treatment occasionally. His next consultation is in six weeks time. Carpal tunnel exercises remind one of the importance of trying the simple things first. I'm a greater believer in each and every one of us doing our best to help ourselves; before consulting a chiropractor or surgeon you may want to try these carpal tunnel exercises for a few weeks. If they don't work, nothing is lost, and then you can become a case file! Thoracic outlet syndrome reminds us that a particular health problem may be secondary to some other condition. For example, a heart attack may be due to neglected diabetes. 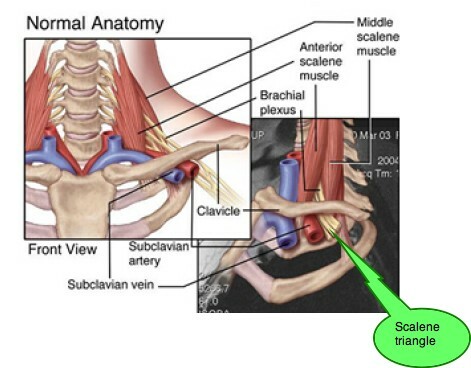 In every carpal tunnel case file there may well be an underlying thoracic outlet syndrome in which either the brachial plexus or the subclavian artery that supply the arm are being irritated. Many arm conditions like carpal tunnel syndrome have a chronic underlying entrapment of the nerve and artery as they emerge from the chest, the so called Thoracic Outlet syndrome. Typically the arm aches especially when raised above the head, and may feel weak and go numb. The nerve bundles passing to the arm, together with the only artery pass through a narrow gap known as the interscalene triangle. 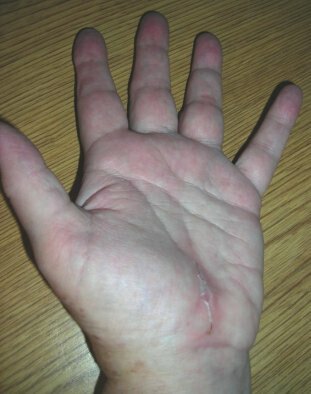 Muscle spasm of the scalene muscles, or a subluxated first rib, may affect them causing bizarre tingling in the arms and hands, and pain too, mimicking a carpal tunnel syndrome case file. Never will I forget examining a retired judge in Holland with tingling in the arms and hands. 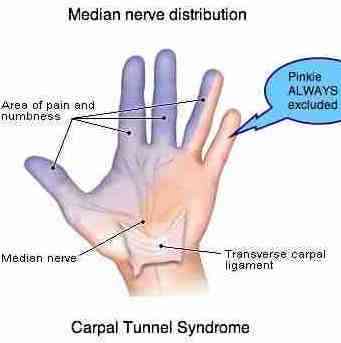 I told I wasn't sure what was the cause, but it definitely wasn't carpal tunnel syndrome; the pain included the pinkie. Both the neurologist and orthopaedic surgeon who operated on him ended up being sued. In fact he was suffering from cervical stenosis. My friendly butcher and I have had some interesting discussions over "hyaline cartilage", the very hard, slippery substance that lines the bones in a joint. He assures me that it is, in young animals, indeed extra-super-smooth. We need it so that your knee for example can bend smoothly whilst you walk. In fact he brought me several samples from a pig, and you can see them at HYALINE CARTILAGE; there's plenty of it in the carpal tunnel too. Preventing decay (arthritis) of the hyaline cartilage in your body is at the heart of chiropractic. How do we do that? Read all about it at the page above. Tingling in arms and hands is common, but probably less than fifty percent of the time is it a carpal tunnel case file. Hopefully it's clear that there are many causes of what's known as paresthesias; tingling, prickling or burning in the fingers, in this instance. We could add the presence of a cervical rib, uncovertebral degeneration in the in the spine, and even vascular causes. Can chiropractic help every carpal tunnel case file? Obviously yes, but it remains a stubborn and unpredictable condition. I don't always win, so I expect my colleagues don't either; but usually we can get it to around the 80 percent better mark. In all truth this isn't a classic carpal tunnel syndrome; the symptoms did follow the median nerve but the major problem concerned the first rib fixation and the impingement as the median nerve passed between the bellies of pronator teres; or under the tendon of the pec minor muscle. It's difficult to grade symptoms objectively; just how bad are your symptoms? The Boston carpal tunnel syndrome questionaire is a useful tool. Return from CARPAL TUNNEL CASE FILE to carpal tunnel syndrome home page.